The Promise of 2 lbs. of Lentils! When my oldest started school a little over a decade ago, I remember feeling overwhelmed with all the paperwork just to get a kid registered into kindergarten. While most other information was on hand, the request of immunization records had me taking a drive to the pediatricians. The extra effort to get this required information made me compare my childhood to that of my children. I grew up in India, a third world country where an up to date immunization was never a criteria for school admissions. In fact looking at the poor rate of literacy, anyone that came to school could not be turned back for lack of immunizations. The country I live in now and the country of my birth may be in the same world but are still worlds apart As of 2014, all 50 states in U.S require diphtheria, tetanus, pertussis, polio, measles and rubella vaccinations for a child to go to school, thus ensuring the environment in schools is free and safe from all these diseases. Having a policy like this in place ensures a majority of the population is immunized. Compare this to the alarming statistics as per WHO (World Health Organization), 12.9 million, 1 in 10 infants did not receive any immunizations in 2016. What that means is that 1 in 10 infants missed that first dose of Diphtheria-Tetanus-Pertussis (DTP) vaccine putting them at a serious risk for some potentially fatal diseases. It gets even worse, of the others that did take the first dose, 6.6 million infants did not complete the three dose DTP immunization series thus leaving them vulnerable. India is one of the contributors to this alarming statistics. While poverty is to blame for most of the problems in India, lack of immunization is definitely not one of those. Government provides free immunization camps for all, in cities and rural areas. Yet the full immunization rate against basic diseases in rural India is a dismal 6%. That number is nothing short of alarming. So when there is a free immunization camp hosted periodically by the government or certain charitable organizations, what holds people back? The answer to this third world mystery came from a pair of MIT researchers right here in US. Esther Duflo and Abhijit V. Banerjee under the umbrella of J-PAL (Abdul Latif Jameel Poverty Action Lab) conducted a research about improving immunization rates in India. These researchers partnered with Seva Mandir, a local NGO in rural Udaipur area in Rajasthan, a western state in India. Assuming that maybe the government run immunization camps were not reliable and often times not well staffed, Seva Mandir began organizing monthly immunization camps in the same set of villages. Held on the same date every month, like clockwork, these well-advertised camps provided free of cost immunization to the children in the village. Contrary to the expectations, these high quality, privately provided free immunization services available at their doorsteps could only bring the immunization rate from 6% to 17%. 8 out of 10 children still remained without full vaccination. Seva Mandir inferred that the issue of poor immunization rates despite the free opportunity was rooted in people’s belief system. Given the very broad consensus that immunization saves lives (2 to 3 million people die every year from diseases preventable by vaccination), you will be shocked to know that according to Seva Mandir’s findings,the traditional belief was quite different. In rural Udaipur among other places, traditional belief has it that children die because they catch the “evil eye” and you catch the evil eye if you are exposed to or displayed in the public. And so, to protect their children from the evil eye, the parents don’t take their children outside for the first year of their life! Now this is a catch 22 situation. How do you convince someone to bring their child to a public place for an immunization to save their lives when they believe it is not the immunization that will save them but the protection from public exposure ? This would require first changing their beliefs and that is no easy task. J-PAL researchers Abhijit and Esther convinced Seva Mandir to try something on a pilot basis: For each immunization that a child took, offer the parents 2 lb. of lentil (a staple in the area) and for completing the course offer a set of stainless steel plates. Seva Mandir was hesitant because not only was it wrong to bribe someone to do what is right for them , according to them the incentive wasn’t quite enough to the tip the balance. If they believed bringing the child out for immunization would expose them to the evil eye then would they really do so for 2lb of lentil (worth Rs. 100 or $1.54) which almost half the daily wage at a public works site ? Due to the long standing relationship between J-PAL and Seva Mandir, the NGO hesitantly agreed to try the incentives program, on a small scale with 30 camps offering the incentives. Contrary to what Seva Mandir feared, this incentives program was a huge success. The immunization rates where the camps were set up went up seven folds to 38%!! The NGO discovered that giving the incentive surprisingly made the program more cost effective because the camp facilities were more fully utilized. 38% is far from 80-90% required for herd immunity as per WHO standards, yet the increase from 6 to 38 % has a huge social benefit. 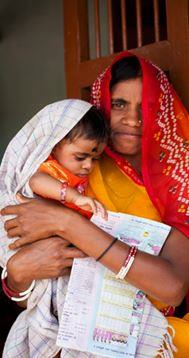 Seva Mandir’s immunization program has been hailed by MIT researchers as one that has saved most lives. Last year alone Seva Mandir camps immunized over 1300 kids in over 113 villages at the cost of Rs. 2400 or $41. These camps are also hubs for other medical services and treat children of common illnesses and provide antenatal checkups. Seva Mandir addresses some of the most critical unmet healthcare needs in the rural villages in Udaipur. Besides healthcare, Seva Mandir has helped 3200 families-16000 people gain access to clean drinking water in the past 8 years. A basic necessity which was a luxury to these families till just a few years ago. In the past 45 years, Seva Mandir has made strides in the fields of women empowerment, Youth development basic health care, child care and education. Every year, 12,000 disadvantaged children receive a quality education in its schools; 8,000 women and children out of reach of hospitals are offered critical health services; thousands more families achieve food security and sustainable livelihoods through the rehabilitation of hundreds of acres of land; and 9,000 women move closer to gender equality and financial independence through women’s groups and lending cooperatives. At Seva Mandir, very modest amounts of money go a very long way toward improving people’s lives. Their impressive track record and their commitment to building stronger communities made them Health Products For You’s pick as a recipient charity for the November 10th Giving Day. A percentage of sales on this day will be donated to Friends of Seva Mandir, USA a 501© public charity that makes grants to Seva Mandir.